We got an exclusive preview of services at your new favorite beauty spot by Art Nail NYC. 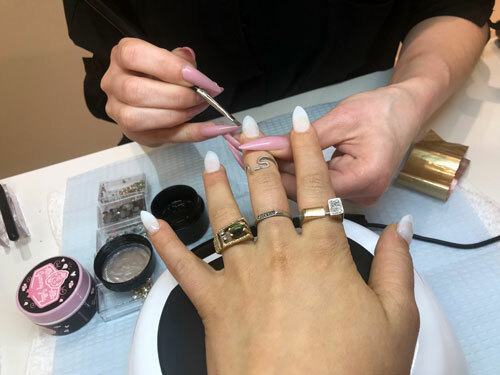 Moving from a much smaller space, Art Nail NYC is getting ready to rock your traditional thinking of the nail salon model you’ve seen in New York. While the salon nails from a background in nail art, they are assembling a team of experts in many categories. There will be a full opening on June 1st, with a buffet of offerings ranging from Sataya ( the owner) and her teams’ INCREDIBLE artwork on nails, lashes, facials and even injectables. We got to sit down with the salon owner, Sataya prior to the proper opening, for a creation on our nails and to speak to her about what makes her salon different. Hailing from California with a background in the medical field, Sataya has had a very different approach to her Nail practice. After moving here in 2017 she opened Art Nail NYC with the intention for it to be a summer pop-up inside a marketplace, it quickly turned into a full-time first location. They are now moving into a larger space to expand the business and give new life to her vision. So what makes them different? The choices she makes are science-based, with the intention of making her clients have the healthiest nails possible. She doesn’t perform services that she finds damaging to nails. “I got into cosmetology after college, I had a year in between undergrad and nursing school and I thought this sounded fun. I fell in love with it and knew this was my calling. I like to mix my medical background with my love for nails. I see it as a science and love others in the field who do the same.” Another point of pride is Sataya likes her artists to do what they find to be most creatively fulfilling. Example by allowing artists who love gel to only do gel brings her clients the best possible results. 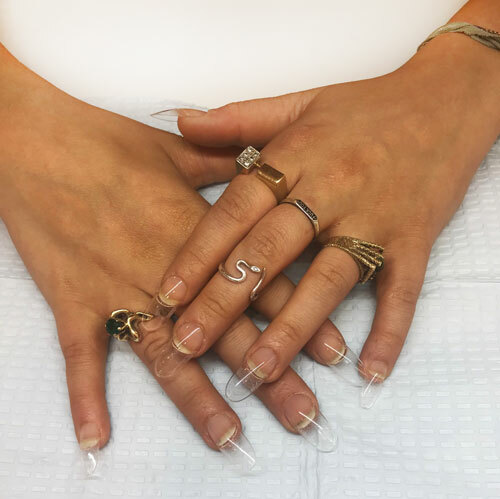 One of the unique features of the salon is Satayas’ love for an IBX treatment, which is a restorative keratin protein that soaks into nails transforming your brittle and broken nails into strong luxe claws. The best part about this treatment is that it even works under your gels or polish. IBX does wonders for people who always must have a fresh coat on their nails as the treatment is locked into the nail bed until the entire applied portion of the nail grows out. This formula works by activating healing properties in the solution with UV light or a LED heated lamp. It uses together the nail’s top layers to improve nail plate integrity. Sataya loves to use IBX for all her nail clients. Whether you are in “nail rehab”, just have thin nails or maybe use traditional acetone based polishes far too often IBX can health you restore the health of your nails while still using your favorite polish or gel. Sataya shared some before and after photos for us of the treatment and we were impressed by the results! We could try this as well our nails were certainly shinier and looked more healthy post-treatment. The heat lamp was slightly uncomfortable and had a tingling sensation but the results are worth it! Next Sataya used a gel based nail extension. This is an alternative to the normal acrylic and glue based extensions used in most salons. This is far less damaging to the health of your nails. The gel based nail is also applied with a gel solution, making a strong bond equivalent to glue. One interesting thing of note about this is the nails feel different than a traditional extension. They are lighter and more comfortable to wear. There was also far less filing down of the nail bed done in the application of this nail making for a less damaging process. This is something we really appreciated as so many nail techs file a tremendous amount damaging our natural nail far more than necessary. She masterfully shaped our extensions into perfect almond shape and then the fun began. 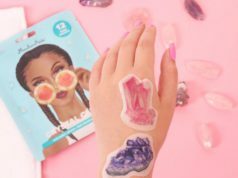 Sataya spoke to us about what we normally like on our nails and took inspiration from the many rings our MyTopFace beauty expert wears every day. We settled on a geometric abstract gold foil application with gemstones to accent. Sataya carefully placed each stone on our nails with a gel-based adhesive to secure these stones to the pinky and ring finger. Sataya herself specializes in making unique and out of the box designs that go beyond her clients’ imaginations. She says she loves a challenge and takes time with every client to make sure they receive their dream set! Importantly Sataya has a concept for this salon that is far beyond the traditional model, Art Nail NYC is to be an education center for all young artists to learn and grow. Once opened the Salon will serve as a place for brands to host educational events and hands-on training for New York licensed nail technicians another exciting way this salon differs from others. She sees each of these top NYC salons as having their own area of expertise and feels there is room for everyone to do well. This notion has motivated her to help others with mentorship as well. 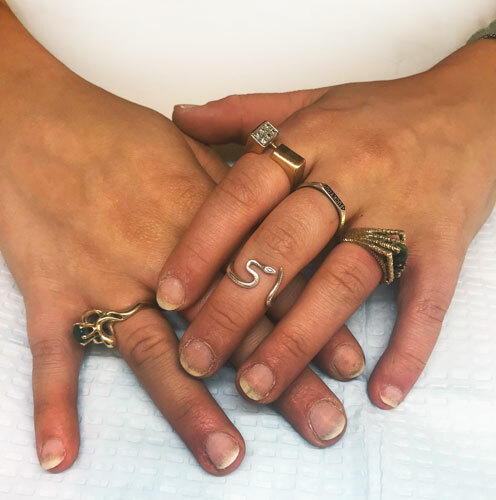 We would recommend heading to ArtNailNYC for her unique process that is thoughtfully invested in the health of your nails. If you are interested in unique designs you have found your new NYC home. They also specialize in any gel manicures, not just extensions.